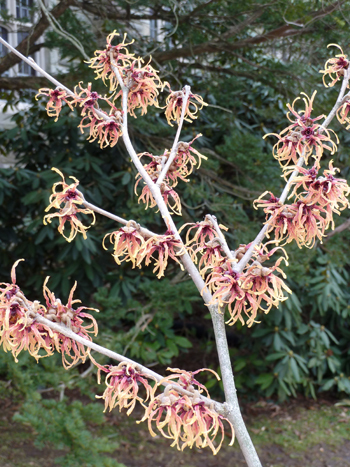 With the warming days has come the blooming of the witch hazels, Hamamelis. These early flowering shrubs are a welcome sign that spring is not too far in the future. 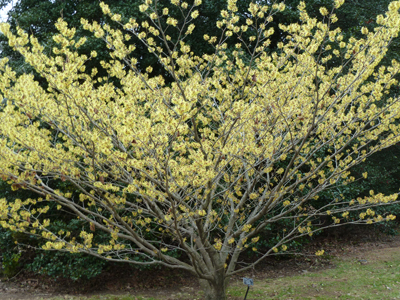 The Scott Arboretum boasts one of the largest collections of Hamamelis in the United States. We have many clones of the vernal witch hazel, Hamamelis vernalis; common witch hazel, Hamamelis virginiana; Chinese witch hazel, Hamamelis mollis and many selections of the hybrid between Hamamelis mollis and Hamamelis japonica, Hamamelis x intermedia. The selections of H. x intermedia offer the most interesting ranging from butter yellow to stunning coppery orange. These hybrids combine the yellow colored flowers and fragrance of Hamamelis mollis with the red flowers of Hamamelis japonica. The color range of the flowers is impressive; however, not all the clones are fragrant. Most Hamamalis vernalis and H. mollis clones are fragrant. This time of year a question that often appears on our blog is which cultivars are best for not retaining their leaves? 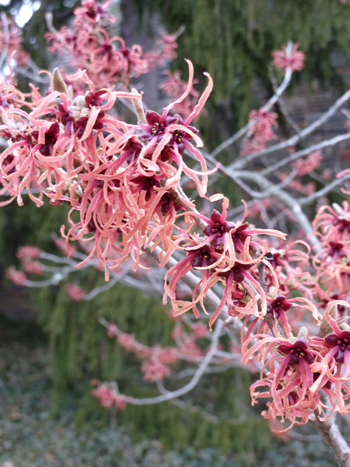 Unfortunately, some cultivars of witch hazel tend to hold their leaves from the previous fall thus masking the spring flowers. This does not appear to be solely to be a condition of genetics, but also might have to do with weather condition, soil conditions, and possibly the species of witch hazel on which it was grafted. Last week Josh Coceano, Scott Intern, and I did an assessment of our collection. We noted which cultivars had leaf retention (% leaf retention), as well as grading the fragrance. Download this chart to see our complete findings. I also took the opportunity to subjectively rank my favorite witch hazels for the day (Curator’s Choice). While I love Hamamelis mollis and H. vernalis they do tend to be two species which hold their leaves. Getting my top ranking was H. mollis ‘Wisley Supreme’ and ‘Early Bright’ which do hold some leaves but have fantastic fragrance. H. x intermedia ‘Feurzauber’ is one of the best red flowering clones. For soft sulfur yellow flowers I really like ‘Primavera’. One of my all time favorites is the coppery-orange flowering ‘Jelena’. And, ‘Strawberries and Cream’ is a beautiful suffusion of red, pink and yellow. If the weather remains relatively cool we should have outstanding flowering for at least two to three more weeks. 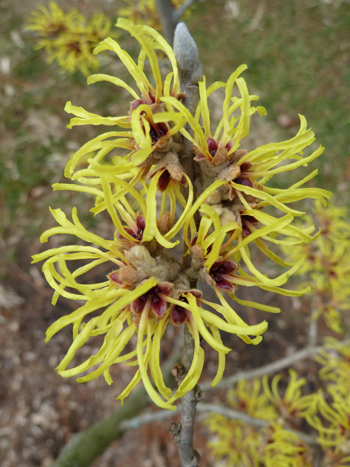 Join Julie Jenney for a guided tour of Witch hazels and Early Spring Blooms on Saturday, March 5 from 1 to 2:30 pm. Thanks Andrew. I particularly appreciated the work you and Josh did, ranking leaf retention and fragrance of many Hamamelis cultivars. I am curious if you intend to revisit these plants in future years to see if varying weather conditions may also play a role in leaf retention. I have a Hamamelis x intermedia ‘Arnold Promise’ that most years has retained leaves almost completely hiding the flowers, and this year has held onto only a handful. In a previous blog Josh also mentioned that you saw variations within one cultivar, H.mollis ‘Early Bright’, in two different locations on campus. I realize it would be tough to evaluate all of the potential factors affecting performance. Yes, I think this is worth further evaluation. I don’t believe this is purely a condition of genetics, however, H. vernalis tends to hold its leaves more so than other species. without naming any names ” We all allow ctiaern plants to get too big over time, and tend to not notice how much space they take up”. Well the Viburnum is long gone and has given me a lot of new real estate and the Hamamelis has been given a new lease on life. Excellent article thank you . Interesting comment about ‘Arnold Promise’ retaining its leaves. I’ve had one for around 10 years in the Annapolis, MD area (zone 7B) and it has never kept any leaves. It’s one of my favorite things about spring. This year my new witch hazel ‘Aphrodite’ bloomed about 2 weeks before ‘Arnold P’ and was very pretty but didn’t have much fragrance. Any chance you share rooted cuttings of these cultivars? My Arnold Promise retains very few leaves. Northwest Missouri Zone 5b, full sun with western exposure. Have you ranked the bloom times? Love your chart (even if it’s from last year)! Now all I have to do is find a source for the more interesting cv’s 🙂 .